There is no shortage of young adult novels that encourage the individual and warn against conformity; Divergent is one such novel. However, the film based on the massively popular Veronica Roth novel ignores those lessons and aims to have absolutely no originality or individuality from its acting right down to its execution. After Tris’s aptitude test comes back inconclusive, she resolves to join the Dauntless faction, dedicated to fearlessness and bravery. If this process sounds similar to another YA novel’s “categorization” element, that’s because it is absurdly similar to the sorting ceremony in J.K Rowling’s Harry Potter series. Harry Potter’s uniqueness is a cause for one particular recommendation by the sorting hat in The Sorcerer’s Stone, yet he disregards it to declare his allegiance to another house. Tris’s “inconclusive” test is actually code for her being a unique anomaly within society called a Divergent. Simply put, this means that her aptitude is not wholly within one faction but a combination of them all. The film’s opening act is relatively interesting and does a passable job of explaining the world these characters inhabit. The problem is that there is not enough “newness” to this story and while the film is just another adaptation of another beloved young adult novel, that doesn’t mean it shouldn’t be held to the same originality standards as any other genre. Furthermore, once the Tris enters the world of the Dauntless, a whole new bag of issues emerges that sink the film even farther. Most of the film from this point forward is an excruciatingly long and played out training set-up piece for a lackluster climactic finish. 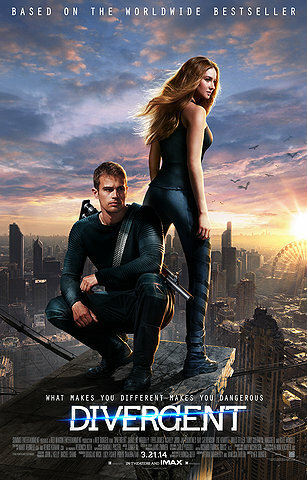 Tris’s struggles at Dauntless are pitted against her secret identify as a Divergent. Will she be discovered? Are there other Divergents? Will she hook up with the hunky “I don’t want to be just one thing,” Four (Theo James)? These questions will be answered, just don’t hold your breath. The film gets so caught up in its own mythology, that it never really even considers convincing the audience why these “Divergents” are so dangerous. Divergents are people who can think for themselves and have multiple skills and talents. It becomes increasingly clear why Erudite faction leader Jeanine Matthews (Kate Winslet) is not fond of Divergents, but why does the rest of society view them as dangerous? A few tacked on lines of dialogue towards the end attempt to answer this, but not to any satisfaction. Divergent is rated PG-13 and has a running time of 2 hours and 20 minutes. Wow, a D+! Not really surprised though because you emoted your dislike through deep and hyperventilating breathing during this entire movie. Is part of this D+ due to her hair’s performance? Oh my God, that hair! Awful!